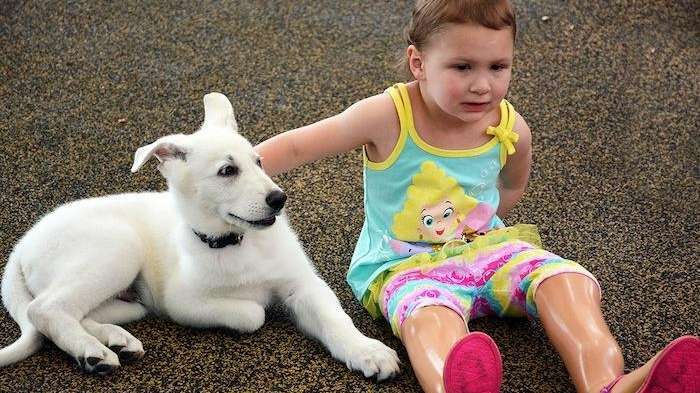 When 3-year-old Sapphyre Johnson and 8-week-old German shepherd Lt. Dan met, they were instantly bound together by a unique connection: They're both missing limbs. Because Lt. Dan was born without his right front paw, many suggested that he be euthanized, his breeder Karen Riddle said in a news release. But Riddle, a white German shepherd breeder, felt determined to find a family for Lt. Dan that would truly understand what makes him unique. 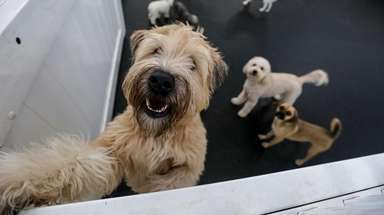 Riddle contacted Greenville Shriners Hospital, a South Carolina-based children's medical center, with the hopes of placing Lt. Dan with a young patient who could relate to the pup's challenges. Elaine Hardin, the hospital's child life specialist, knew exactly who to share his story with. When she showed Shriners Hospital patient Sapphyre a photo of the pup, the 3-year-old noticed right away that they had something special in common. When she saw Lt. Dan "she said, ‘That’s my puppy! He looks just like me!’” Sapphyre’s mother, Ashley Johnson, said. A Shriners patient since she was 3 months old, Sapphyre was born with a congenital condition that resulted in the bilateral amputation of both of her feet. “Having her recognize that immediately was really special because, with the exception of our visits to Shriners, she doesn’t see a whole lot of people who have similarities to her," Johnson said. On Monday, Sapphyre met Lt. Dan at the hospital and the pair has been together ever since. The Johnson family adopted Lt. Dan, giving the pup a new home and Sapphyre a new friend.